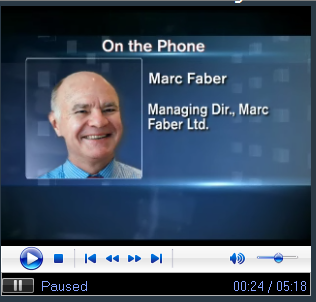 Here is an interesting interview with Marc Faber on the dollar, the Euro, commodities and global equities. Q: Is the Euro Doomed to keep falling? A: Whenever global liquidity tightens relatively speaking, it is very US$ supportive. Obviously, there are always time lags between economic events until the the market perceives them. So as a result of weak demand in the US, lower imports, the demand for oil declines, and that led to a tightening of global liquidity which led to the strong dollar. Investors speak of weak oil price as being bullish but the point is that it signals the global economy is in recession already. Q: Is your point that if Europe slows the US economy slows further? A: Relatively speaking the US economy is in better shape because of the weak dollar. My view was that after 4 years of underperformance in the US compared to Europe, that the US would now outperform for 3-6 months and I still maintain that. The dollar can continue to rally somewhat as Europe will have to cut interest rates as well, and their economies are most likely much weaker than perceived. On a relative basis, if you put a gun to my head and said you had to buy somewhere it would be in the US. Q: What about commodities Marc, is this the end of the bull run? A: We are in a seven year bull market for commodities, so commodities can easily drop 50%. Some have already done that like nickel, lead, and zinc. Others will follow. But after that, I think that the bull market in commodities will reassert itself. But my view was that for the second half of 2008 commodities would go down. Q: Is there any other currency or stock market that looks good to you? A: I am not buying US stocks, but I am long the US dollar. Relative performance may not mean that US stocks go up, they may just go down less than others. Where I am long and optimistic is essentially about Japan. And I would be very wary of the favorite trade of the last two years, long commodities, long steel stocks, long iron ore companies, etc.